Do you keep showing up at trade shows and leaving with little to show for it? Unfortunately, some exhibitors continually make trade show marketing mistakes that sabotage their success. But savvy businesses know that one of the greatest tricks of the trade show lies in the look of the booth. They’ve learned how to create a compelling display that captures attention, clarifies their brand, and conveys their message in an impressive way that leaves an impression. To help exhibitors avoid everyday errors by refining the design of their trade show booths, SkylineTradeShowTips.com revealed these four trade show secrets. Minimize Your Message – Too many exhibitors overload their displays with all of their marketing and graphics, but end up overwhelming their target audience. This results in a booth that lacks a clear message and ultimately leaves them lacking for prospects. Rather than show too much too soon, offer a little tease that piques the target’s interest and makes them want to learn more. Achieve this less-is-more approach by defining your business with a single large image and a few well-chosen words that draw people in and allow you to convey your message one-on-one. Focalize Your Brand Identity – Some exhibitors try to be all things to all people and end up with nothing but a display that doesn’t express their brand identity. Instead, let your brand identity be the focus of your entire booth to give people a clear and complete picture of your brand and your business. Organize Your Interior – No matter how polished and professional your booth’s exterior, a cluttered interior will damage its impact. But presenting a streamlined and well-ordered interior display will serve as a reflection of the service your brand provides. Try using cabinets and shelves to hold your marketing materials, while keeping personal belongings out of view. 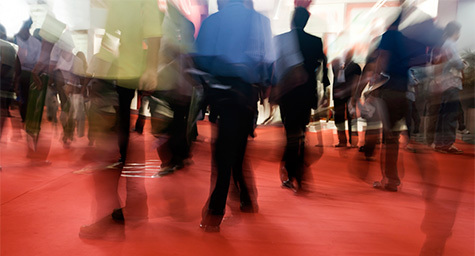 Capitalize on the Traffic Flow – There’s always a specific traffic flow at trade shows, yet many exhibitors are unable to adapt to this key condition. It’s better to be prepared to “go with the flow” and design your booth so it can be readily reorganized at a moment’s notice. This allows you to optimize your opportunities to reach the current crowd at every show. Also, try to get a booth near the front of the venue to put you literally in front of the competition, or claim a corner booth to gain exposure to two directions of traffic flow rather than only one. Try trading up to these proven practices in your next trade show booth and see what a difference a design can make. Discover effective and efficient trade show marketing strategies. Contact MDG Advertising today at 561-338-7797 or visit mdgadvertising.com.